Since I've gotten my November Runfession out of the way and have attempted to alleviate myself of my shopping guilt, I thought I would share the treasures I've purchased with you over the last 48 hours. But first, let's start with running. I did not run an organized Turkey Trot on Thanksgiving, but I did my own "trot" in the morning and ate turkey in the afternoon. I'm in week 3 of NYC Marathon recovery and think I'm doing pretty well, but I'm running a half with my mom in two weeks and so mentally wanted to feel prepared. I did my long run a day early, but got in a nice 10 miles (on the difficult path), felt strong, felt like I could have definitely gone further, and ran negative splits! Maybe I'm stronger than I thought? So this picture exposes one of my Black Friday transgressions, so let's just go there. First up, I retired my 8 year old Garmin and bought myself a nice, shiny, purple Garmin 230! My local Fleet Feet was having a major sale (scored this $70 off), which also made me feel better that I was supporting my local running store. They were also running a sock sale (buy 3 get 1 free) and my Garmin purchase resulted in a $25 credit. So then I got a great deal on some new socks, which I definitely needed. Plus these bright colors just made me happy. Next up, I got really crazy. Most of the time I run alone and music is just one of those things I have to have. I try to stay aware of my surroundings, but you can never be too safe. I've been hearing a lot lately about Aftershokz (open ear, bone conduction headphones). There was a deal where if you bought a pair, you also go 6 free mystery gifts - I scooped up a pink pair and had a 10% off coupon. Can't wait to try these babies out and see my extra gifts! Then there was the purchase I never expected to make, but the chatter about the 40% off sale at 2XU was too much to take. I also had an extra 10% off coupon, so I got a crazy good deal on some compression tights. I have to say that these are the ones I'm most excited about getting. I did get a few other things, but they would reveal Christmas presents for at least a couple people who support my blog, so I can't go there yet :) So, I feel like even though I spent WAY more on myself than I usually do - especially all in one shot - I did get exceptionally good deals on all of these things and I will certainly use them all. Expect reviews in the future! 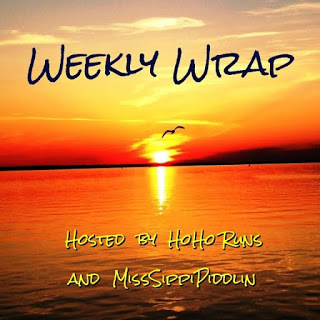 I'm linking up with HoHo Runs and MissSippiPiddlin for the Weekly Wrap. 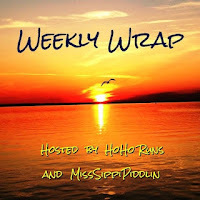 Promise my next Weekly Wrap will be more running and less shopping! Did you make any big splurges? Do you have/have you used any of the items I purchased? I almost bought those 2XU tights! I loved the red, white, and blue! But I splurged on a few other things for myself. Like headbands from sweaty bands--they had 30% off and free shipping! I also bought some Goodr sunglasses. I got the Garmin 230 for my birthday and I just love it! I didn't need the HR feature of the 235 and that seemed to be the only difference between the 2, besides price. The 230 was a huge upgrade for me from the 10. Why did I wait so long? I'm hoping the tights fit! I'm right on the line of small and medium, but they only had smalls and extra smalls (fingers crossed). We shall see! I do love Sweaty Bands though - always a good purchase and they last FOREVER :) Glad you got some good deals, too! I'm loving my Garmin 230 as well! I struggled between the 230 and the 235, but couldn't justify the price for a HR feature I never use. Plus it adds bulk to the watch and I have super tiny wrists (if only the rest of my body matched). Plus, giving up the HR feature buys you more battery life. No idea why we both waited so long! Your Black Friday shopping sounds a lot like mine! You will love the Aftershokz! Haha I for SURE needed that Garmin! Actually starting to use it, I'm realizing just how in the stone age I was with my old one. Your comments on the socks is so funny - I have a bunch of old white ones stuffed into the corner of my sock drawer, but I never use them anymore because my new, colorful ones are so much better! And white shoes ... yikes! ;) I hope you're right about the Aftershokz! And I have to check out Prana. I love everything you've posted and I know Wendy is a fan as well! I'm a huge fan of Lucky :) Ah, so many tempting places to spend money! I bought Miracle on 34th Street, but that's it. I didn't have it among my Christmas movie collection, and had to fix that. You have such great restraint. That is so sweet and festive! I think you made a great selection - please send me some of your willpower! I haven't bought anything (yet). I did register for a Spring half marathon at a super low price. I really like those compression tights! I barely ran in tights last year though since we had a warm winter. I do need to stock up on socks. Sorry I missed that deal. Thanks for linking, Lindsey! The 2XU deal is still going on in case you want to pick up some socks! I love that some races are doing discounted registration for Black Friday/Cyber Monday. I registered super early for a November half marathon because the price was so low! Thanks for hosting! Lindsay, sounds like you scored some really sweet deals. I've been looking at recovery tights so anxious to hear what you think of your 2XU. Are you going to run in them or use them for recovery? I seem to have a sore right knee from time to time and my coach suggested recovery tights but I thought I would wear them afterwards not during the run. 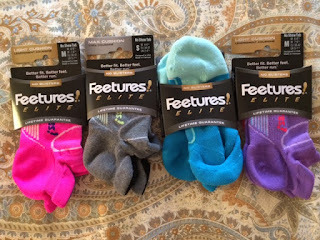 Love those deals that Fleet Feet offers too. They are the best. I'm just seriously hoping I ordered the right size tights! My plan was to use them for running, but I bet they would be good for either. Hmmm that's interesting about your knee. Any connections you can find? Running hills? Hard workouts? Long runs? It's always something isn't it!? Wow! Looks like you got some great deals! I love those feetures socks. Yeah I got too many great deals :) I'm a huge fan of the Feetures as well - the fit and the colors! Ahhhh, thanks for sharing on the Garmin 230! I've been using the Garmin 105 for the longest time and am considering trying to upgrade, so any ideas are super helpful. The purple is so beautiful!!! Hurray for Fleet Feet - they are my favorite running store, too! Lol I also got sucked into the 2XU sale and bought a pair of compression tights! I really needed some new long tights, so I don't feel too guilty about spending the money. Now I just can't wait for them to arrive. I can't wait to get mine either! I'm just so anxious about the size. I've never tried them before and I am right on the line between sizes. Fingers crossed! Hope you love yours! Black Friday shopping is all about me- don't feel guilty- great job!